and droppings (guano). The droppings can accumulate in high amounts, making a real mess in the building. The urine and droppings can seep down walls, corrode wood, and cause a bad odor. In addition, over time, mold can grow on the droppings, which can lead to lung infections. Bat colonies do not relocate once they've found a place to live, and only grow larger with time. It's best to have the bats removed. We remove all of the bats, we don't harm or kill a single one, and completely bat-proof your home for a permanent solution. We are a professional wildlife removal company, offering bat control services. We aren't a pest control or bat exterminator company. We provide humane bat exclusion, and a completely solution to your Houston bat problem. How to get rid of bats in the attic - Bats in the attic, if there is more than a handful, are often female bats. These females will be inside of your home because they feel it makes for a good area to raise any young. Because of the legal issues surrounding bat removal, having a professional handle the bat issue around your property is reasonable. There are no approved poisons for bats, and any exterminator that tells you otherwise can get you into a lot of trouble with the law. Not only will insecticides kill some of the bats but not all, those that do die will crawl into the spaces of your home and then decay. If there is one thing worse than a single dead bat stinking up the building, it is twenty or a hundred dead bats stinking up the home. There are also no truly effective traps for bats. The best method for getting them out of the attic is through the installation of an exclusion doors or netting. The idea behind excluding bats is that they emerge from the building at dusk to hunt. The netting or doorway will allow the bats to exit, but the design will not allow them to return. You need to be aware of the presence of infant bats within the attic. Excluding the mothers and leaving the young will result in dead babies throughout the home. Should Houston bats be trapped in cages? Before diving in to the discussion on whether bats should be trapped in cages as pets or lab experiments, it is better to be somewhat knowledgeable about the bat and its behavioral characteristics. Bats are the only mammals capable of flying and are commonly found throughout the world. Although there are numerous types of bats living today, they all are referred to as an “exotic wild animal” species that find habitat in typical places situated at a considerably great heights. The most common habitats for bats in the outside world are tall trees and inside caves. Texas bats are nocturnal creatures; they travel and hunt in the night, and find sanctuary within the shade during the day. A common myth prevails that Texas bats are blind. But in fact bats actually suffer from very weak visual senses due to their small and poorly developed eyes. 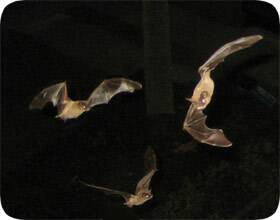 Bats adopt echolocation as means of “seeing”. Echolocation involves the process of bats emitting ultrasonic sounds to produce echoes, and hearing them with its large and sharp ears. Although it is safe to assume that a bat should in fact be kept in a cage, there are a number of reasons why it isn’t a good idea. First of all one should think about the reason of putting a bat inside a cage. Most commonly, people are found to trap these poor creatures in cages because they want to keep them as pets, for scientific research or experimentation, showcasing them in zoos etc. Though it depends on person to person, bats aren’t exactly the petting kind of animals. This “night creature” isn’t your typical housecat when it comes to playing with them, taking care of them and hanging around with them. Putting a bat in a cage means restricting their habitat to your own means. Such a wild creature needs its own instinctive learning and adaptability to an environment. Even though it has poor visual senses, a bat can detect external stimuli. Knowing that it is being controlled will scare the poor creature and could tamper with its physiological growth. Considering purposes of scientific research and conservation of their species, controlling a bat’s environment inside a cage would seem a good idea. But in such a case, direct human contact is probably not the best way. The environment inside the cage must be altered frequently as to not arouse suspicion amongst the creatures, the sense of control and authority. Conservation of their species and putting them in zoos is very common. It’s quite beneficial to our ecology in preserving certain kinds of species of bats and it’s really harmless to show a kid from school what a bat looks like and how it behaves. But to create an efficient and “real” habitat, it must be kept in mind the different environmental features adopted by the kind of Houston bat as every type has its own requirements. It’s not harmful to cage a bat if the proper measures and precautions are taken such as building a large cage built at an elevated spot for bats to absorb heat during daytime. What should be the main concern is the objective behind controlling a bat in a set environment. These are grandiose creatures and should be dealt with accordingly.